When the calendar turns to February, do you instinctively know it is time for pitchers and catchers to report for spring training? Do you play fantasy baseball? Remember fondly your days as a kid, listening to the late-night game under the blankets on your transistor radio? Does summer have you itching to head out to the old ballpark? If so, you might want to consider a baseball tour. Several companies offer packages ranging from a few games to two-week swings through multiple parks in both the American and National leagues. Of course, you can put together your own tour – just get in the car and head out. But a tour company may make it easier. The advantages of a baseball tour are similar to the advantages of any kind of tour – primarily, that someone else handles the details. The tour company gets your tickets – often better than you probably could score on your own – and handles your transportation and hotel room. Your traveling companions are likely to love the game as much as you do, and you may enjoy talking with them about ERAs, the designated hitter and the impact of steroids. Knowledgeable guides can also add to these discussions. On most baseball tours you travel by luxury bus from ballpark to ballpark. Accommodations range from two-star to four-star hotels, and many packages include extras like tours of a Major League stadium or visits to nearby attractions, both baseball and non-baseball. Favorite stops include the Baseball Hall of Fame in Cooperstown, N.Y., and the Field of Dreams, the baseball field in the middle of a cornfield in Dyersville, Iowa, that was featured in the Kevin Costner movie. You can go by yourself, of course, or you can bring the family or friends. Most tours are slightly more expensive for people traveling alone, and some offer group discounts. If you are bringing young children, make sure they can handle the travel without driving you or other bus passengers crazy. If you have very young children or grandchildren, you might want to start them out with a few games at your home-town ballpark. 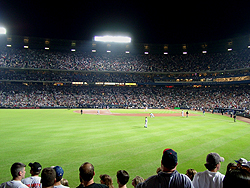 You can find baseball tours through your travel agent or on the Web – search for “baseball tours.” As with any travel company, find out all you can before you send money. Ask how long they have been in business, whether they can provide references, and what your recourse is if the tour does not turn out as promised. Understand exactly what your tour includes. Most cover the cost of your ticket, of course, but do you have to buy your own hot dog or program? And what happens if the game is rained out? Diamond Baseball Tours, 800-275-1567. This Morehead, Ky.-based company offers a wide variety of tours. Its Classics Tour includes a visit to the Baseball Hall of Fame and stops at three of the game’s most famous venues: Wrigley Field (Chicago Cubs), Fenway Park (Boston Red Sox) and the new Yankee Stadium, as well as a few modern classics and a stop at the Hall of Fame. You’ll see a total of six games during the seven-day tour. The cost is $1,350, double occupancy. There are several other tour packages, many shorter and less expensive. Jay Buckley's Baseball Tours, 888-666-3510. This LaCrosse, Wis.-based company offers spring training trips to either Arizona (11 days for $1,775 double occupancy) or Florida (12 days for $1,895 double occupancy). If you don't want to commit that much time or money, you can also take a quick Midwestern trip, seeing games at Miller Park (Brewers) Wrigley Field and the new home of the Minnesota Twins, for $575 double occupancy. There are also longer tours, from Chicago eastward and through the West. These tours usually include attractions for both the fan (the Field of Dreams, the Louisville Slugger bat factory, the Hall of Game), and the fan’s loving companion (tours of Manhattan and other cities, shopping expeditions, a trip to Niagara Falls). The non-ballpark options depend on which ballparks are visited, of course. Road Trips, 800-465-1765. This company lets you build a customized personal trip to any ballpark you choose. It also offers set multi-city tours like its Baseball Hall of Fame Tour. And Road Trips can get you some of baseball’s hardest tickets, although they won’t come cheap. The three-day All-Star Game package includes tickets to the big game and first-class accommodations. Prices start at $1,375, double occupancy, and you can add on tickets for various All-Star events. Road Trips also offers tour packages in other sports, including football, hockey, basketball, auto racing, horse racing, golf, tennis, World Cup soccer and the Olympics.